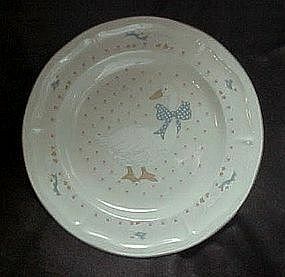 Nice stoneware dinner plates are in the aunt Rhody or blue goose pattern. These are made by Brick oven which are identical in every way to the ones made by Tienshan. Measures 10 3/4" in diameter. Pink calico hearts background, white goose with a blue polka dot bow, and blue edge trim. I have 4 from this maker and more by Tienshan. All are in pristine condition. Price is per plate.